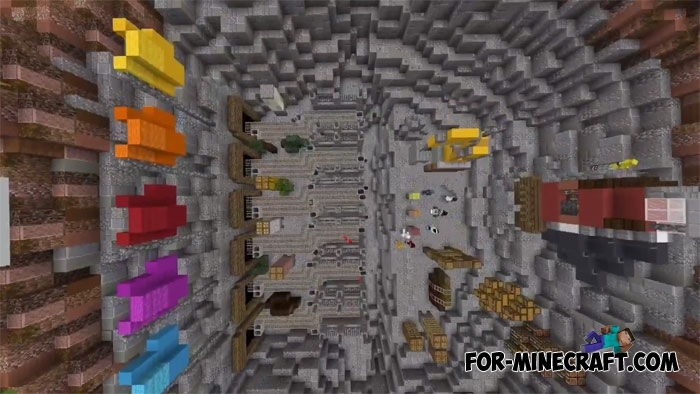 Minecarts are your main opponents in this mini-game, but it's not as simple as it may seem. There are no direct battles between players, the strongest will be the one who will be able to evade moving trolleys towards them. They do not stop for a second and can easily push you down if you relax or get distracted. 3 branches of the railway are laid in each of the six tracks, so the player needs to react quickly enough and move in different directions. Partitions between the tracks allow you to watch the game of friends but do not get distracted often. This is not the first project for Minecraft BE, see the others using the search.